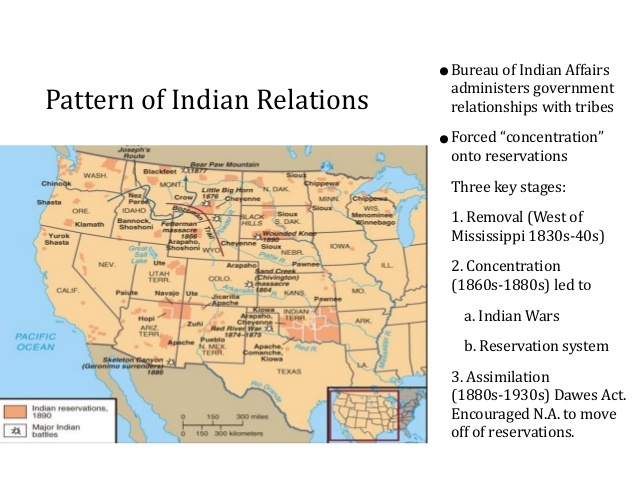 The Great West and Agricultural Expansion. Destruction of the Indian. 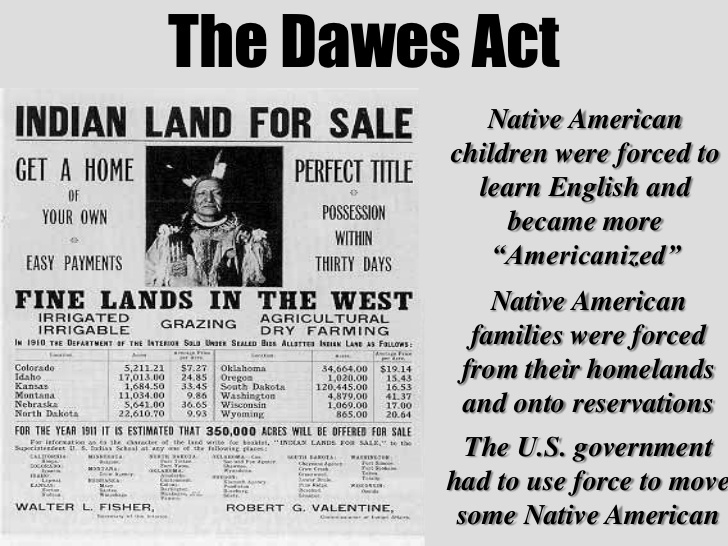 There were three major phases in terms of the government's relationship with Native American people. In 1893, Frederick Jackson Turner read an essay during the World Columbian Exposition which was incredibly influential in its characterization of the west as the new American challenge. In his analysis, the frontier produced the kind of rugged individualism essential to democracy and allowed American culture to be continually reforged and renewed as its citizens traveled westward in a series of waves. 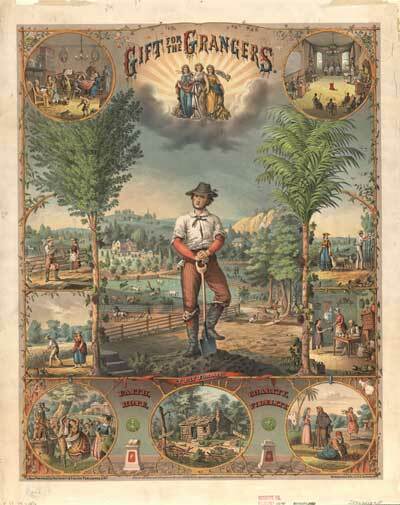 This vision of a unique American character, forged in the crucible of the challenges of the frontier, separate and distinct from the influences of Europe, without regard of the impact of race, class or gender, influenced generations of historians who would later promote this concept of American exceptionalism. The first cattle drives were motivated by the gold rushes in California. Ranchers in Texas drove large herds of cattle to San Francisco to capitalize on the market for beef generated by the towns springing up as a result of the desire for gold. During the Civil War and by the end of the gold and silver rushes, ranchers found that they could no longer rely on their usual markets to sell their beef. Eventually new trails were formed and the migration of people into the plains areas led to new markets in the north. Word History: In the language of the American West, a stray or motherless calf is known as a dogie. The origin of this word remains uncertain, but Ramon F. Adams, the author of numerous works on western Americana and a cowboy himself, offered one possible etymology for dogie in his book Western Words. During the 1880s, when a series of harsh winters left large numbers of orphaned calves, the little calves, weaned too early, were unable to digest coarse range grass, and their swollen bellies "very much resembled a batch of sourdough carried in a sack." Such a calf was referred to as dough-guts. The term, altered to dogie according to Adams, "has been used ever since throughout cattleland to refer to a pot-gutted orphan calf." Another possibility is that dogie is an alteration of Spanish dogal, "lariat." Still another is that it is simply a variant pronunciation of doggie. The American Heritage® Dictionary of the English Language, Fifth Edition copyright ©2016 by Houghton Mifflin Harcourt Publishing Company. All rights reserved. Just as boom towns developed as a result of the gold and silver rushes, cow towns sprang up all along the cattle drive trails. These towns, catering to the needs of cowboys and featuring ample dance halls, brothels and saloons, were often quite lawless. Click on the picture to the right to learn about Abilene, Kansas. Cattle drives continued for about 20 years (through the late 1880s) until the railroads grew and ranchers had closer access to railheads. Rail transport not only changed the speed of delivery, but as tracks were laid and refrigerated rail cars were developed, trains could go to where the cattle were located. Thereby reducing rangeland degradation on the way to market and keep weight on the animals because they had not been moved 500-1000 miles north. Barbed Wire: Prior to the invention of barbed wire, the only method of fencing animals in was wood. This was expensive, time consuming, and wood was not available in abundance on the open prairie. It was not a feasible option for large cattle herds requiring miles and miles of fencing, so they were managed on the open prairies or rangeland. The invention of barbed wire allowed fences to be built. As land owners began fencing in their properties, it became more and more difficult to drive cattle. Barbed Wire. 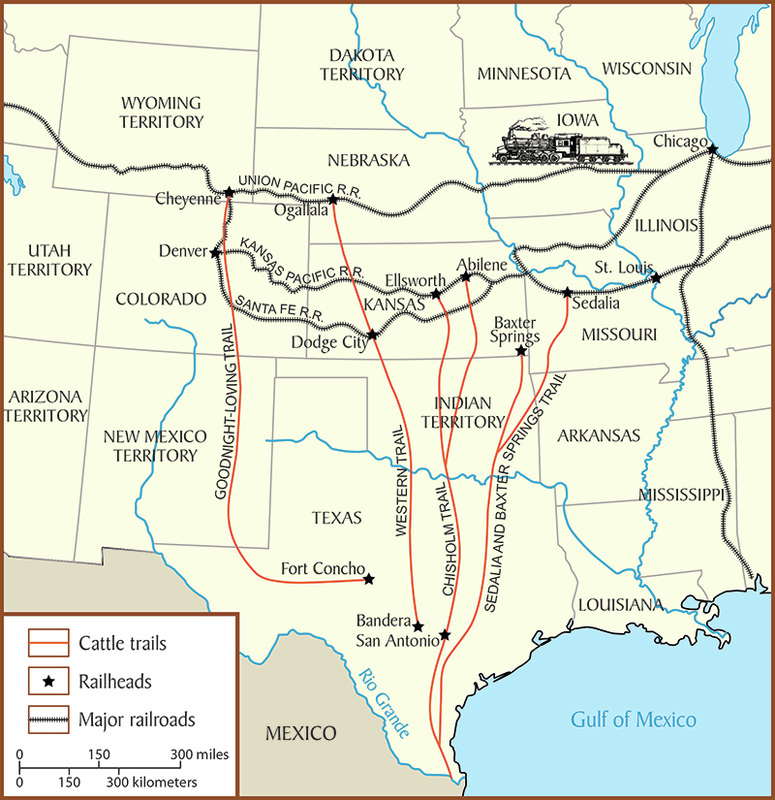 Railroad: When railroads reached Texas, ranchers were able to transport their cattle to the market by railroad. This mode of transportation was safer and more efficient. As refrigeration became common place, cattle were slaughtered at the railhead town and then moved to cities for distribution. Beef Cattle Markets: The era of the cattle drive began due to the high demand and high price of cattle. Like every market, cattle prices rise and fall. The last years of the cattle drive brought low prices for cattle ranchers. 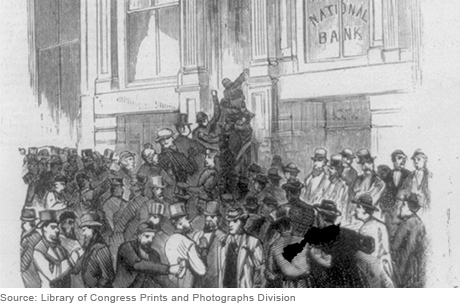 Low prices led to little or no profit and contributed to the end of the cattle driving era. Texas Fever: Another contribution to the demise of the cattle drive was the outbreak of what was then called, "Texas Fever." Texas Fever was a deadly disease for cattle. It acquired its name because cattle from the East or origins other than Texas contracted the disease after mixing with cattle from Texas. At first, the disease was especially difficult to understand because cattle from Texas never contracted the disease, only cattle from other parts of the United States. Later it was discovered that the disease was caused by a protozoa that was transmitted by ticks. The ticks would be transported to holding facilities or pastures on Texas cattle. Then, the ticks would drop off the cattle and lay eggs. The new ticks would carry the disease and infect the cattle with the disease that the hardy Texas longhorns were immune to. 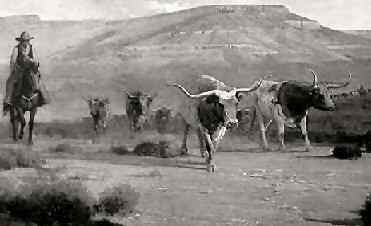 Texas Fever caused quarantines against Texas cattle making it difficult for ranchers to continue trailing their cattle to the markets. 'The Grange Awakening the Sleepers.' 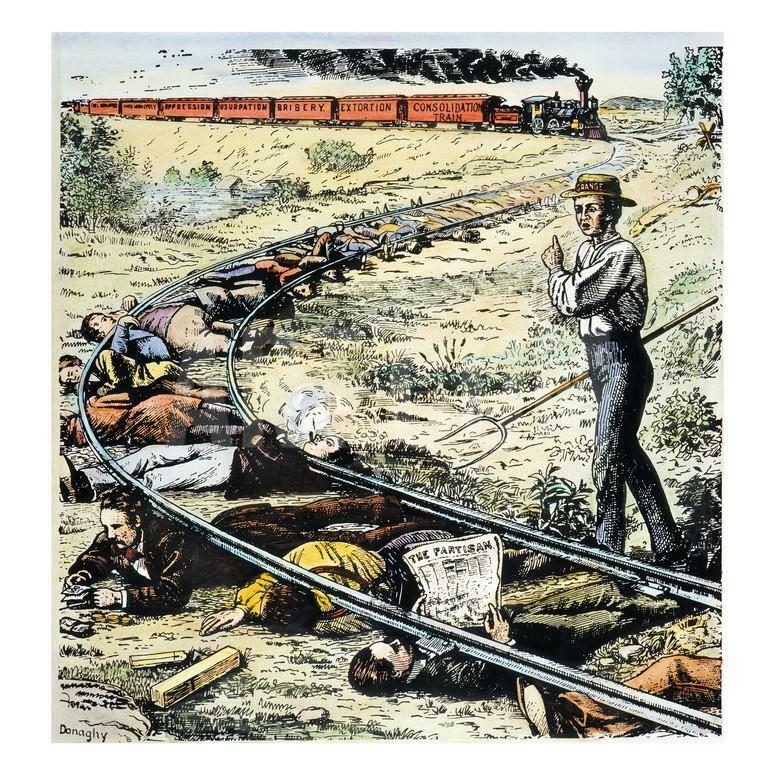 American cartoon, 1873, inspired by the Vanderbilt system of secret rebates, showing a farmer trying to rouse the country to the railroad menace.